Iran’s Foreign Ministry Spokesman Bahram Qassmei has categorically denied the new accusations raised by Israeli Prime Minister Benjamin Netanyahu against Iran at his UN speech. Qassmei’s reaction came in response to reporters’ questions regarding Netanyahu’s latest anti-Iran theatrics and allegations at the United Nations General Assembly. “After the United States and Israel’s failure to play out anti-Iran scenarios, these farcical claims and [this] show by the prime minister of the occupying regime [of Israel] were not unexpected,” said the spokesman. “This is a new show by the authorities of the occupying regime of Israel which we strongly reject, though it is not worth talking about,” said Qassemi. He said Israel and the US sought to paint an unpleasant picture of Iran at this year’s UN General Assembly, but failed to do that. “After the failure of all of the Israel regime and the United States’ plans to tarnish Iran’s image at the recent [UN] General Assembly session, and following the US’ show at the [UN] Security Council, which turned into a fiasco for the US and its delusional officials and disgraced them and turned into a meeting to condemn the United States’ breach of commitments, and following this international embarrassment and the mental confusion of the Israeli regime and spiteful American officials some of whom are subservient to some extremist and terrorist groups and, like earthly devils, always wish to make hell and are against peace, security and stability in whatever part of the world, it was expected that they would turn to fabricating new scenarios and telling new lies and somehow make desperate attempts to restore their lost reputation and make up for their great embarrassment,” Qassemi said. The spokesman reiterated that the only authority to look into nuclear issues is the International Atomic Energy Agency (IAEA), which has constantly maintained its supervision and pursued its verification plan. “So far, the IAEA has, in 12 reports, corroborated Iran’s compliance with all of its commitments under the JCPOA (the Iran nuclear deal), which is also confirmed by the international community, all relevant authorities and other signatories to the JCPOA,” Qassemi noted. “The occupying regime [of Israel] should know that in the modern age, the whole world – as he [Netanyahu] himself saw – will just laugh out loud at such untrue, injudicious and hollow remarks and false shows,” Qassemi said. Qassemi’s reaction came after Netanyahu once again took the podium at the United Nations to bring out fresh theatrics against Iran, repeating his threadbare allegation that the country is working to develop nuclear weapons at “secret” sites. 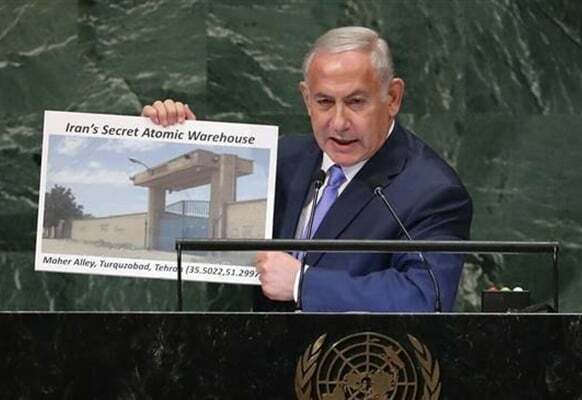 As already expected, Netanyahu used a map and photographs of a building that he claimed was a “secret atomic weapons warehouse” in the Iranian capital, Tehran, to justify his false accusations during his speech on at the 73rd annual session of the UN General Assembly in New York on Thursday, September 28, 2018. Netanyahu was referring to his earlier dubious show against Iran, during which he went live on television and put on display what he called records from a secret warehouse in Tehran. Also during his Thursday’s anti-Iran rant, Netanyahu slammed the European Union for firmly supporting the nuclear accord after Washington – influenced by intense Israeli lobbying – scrapped the international document. “While the United States is confronting Iran with new sanctions, Europe and others are appeasing Iran by trying to help it bypass those new sanctions,” Netanyahu said, referring to EU efforts to compensate for Washington’s absence and keep Iran in the deal. Netanyahu’s new vaudeville at the UN was nothing new. Observers say the Israeli premier indulges in theatrics as a method to influence public opinion, without providing any proof to support his claims.